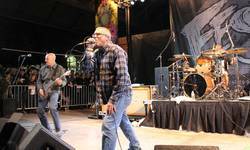 Former Kung Fu Records pp-punks Audio Karate have announced a run of reunion dates where they'll be opening for the Descendents. Legendary Descendents' drummer Bill Stevenson produced the band's Lady Melody record back in 2004. The band formed in the 1990s and officially went on hiatus in 2006. Wiretap Records, Hidden Home Records, and Kung Fu Records recently teamed up on a vinyl reissue of their 2002 debut album Space Camp. April 7 update: Radkey and Rehasher will also be playing dates with the Descendents, also listed below.